The documentary film that Chinese filmmaker Jia Zhangke is making for the 2010 Shanghai World Expo may not be ready in time for the event's opening in May, CRI has learned. Jia, who is editing "Shanghai Legend" for final release, has been suffering from eye strain because of overwork, according to a source close to the director. Post-production on the film has been halted. The exact release date has yet to be determined. "Shanghai Legend" focuses on the lives of local residents and chronicles the urbanization of the host city of the 2010 World Expo. The film was originally due out during the exposition, which will run from May 1 to October 31. 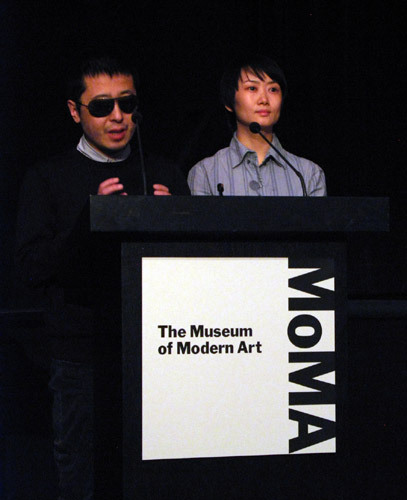 A three-minute trailer of the film premiered on Monday at the Museum of Modern Art in New York, which is holding a retrospective exhibition of Jia's films. The director was seen at the exhibition wearing sunglasses. Jia is one of the best-known Chinese filmmakers in the international cinema. His other famous films include "Still Life", which garnered the top Golden Lion award at the 2006 Venice International Film Festival, and "24 City", which was nominated for Golden Palm at the 2008 Cannes International Film Festival.